See what others have to say about the book further down this page. When you click on the Image below, the book will download directly to your device. Check your Downloads folder if you don't see the downloaded document in your web browser. Due to the new General Data Protection Rules being introduced by the EU on 25 May 2018, I have decided to no longer offer this particular eBook by email but am now providing it as a direct download from this page for you to freely take. Also, I will no longer collect reviews by email request. However, if you would like to provide your feedback after looking through this book, I would love to hear from you on your own incentive either through the Contact Me page or in the FaceBook Comments box at the bottom of this page. Thanks! If you have any questions about the information in it or need more help, please use the Contact page, or ask your question in the FaceBook comments box at the bottom of this page. Easy to understand and very helpful . Very good useful information. For beginners. Extremely helpful, easy to access, everything I needed in one place. Lots of information that enlightened me on the principles of double entry. I would like to have seen more templates. All in all I was pleased with the information. This book was extremely helpful in setting up a very small accounting of a not for profit store. I was looking for forms to allow me to keep accountability of funds and merchandise. Thank you very much. Love this book. It teaches you everything that you need to know to do your bookkeeping while stressing the reasons why you should have an accountant at your disposal. The forms are of great help in saving time. Forms and Templates were good for businesses, but I was looking more for personal use. Very good book. Thank you very much. Very nice forms. I can actually use only 2 of them, but glad I now have the others if needed. Very useful for my small business. Very user friendly. Great for a first time book-keeper. The forms were simple to use and very effective. This was so helpful--Thank you for making this available!! A great refreshing of my memory, after not doing any bookkeeping for 15+ years. I found it useful. and have used the templates in my own business. I used some of the forms for my accounting class. Friendly voice, readable easy text. Thank you for leading me by the hand in a comfortable and easy to understand manner. The best of the best. Helpful in all aspects. As a beginner I feel professional thanks to your help. Even queries are just a click or mail away. thanks on behalf of Febstine Retail Cleaning. The templates and the section on single entry bookkeeping were very helpful to me as my business is very simple single entry seems the best system to me. I am studying on the course now. Those forms and templates should save me much time to searching them when I need to use in the future job requirement. This was very helpful to my business that I have just started! Thank you for everything! I signed up to help a friend who is setting up a small business. I am retired and while reviewing the content, I wish I had this help when I was working as a bookkeeper. Loved the spreadsheets saves me so much time. Excellent resources and explanations for a beginner! Really liked the sample templates that help to illustrate the way a form should be completed. The examples were very useful. Very useful. I am about to start my annual tax return and this information and templates will be invaluable. It really refreshed my memory and still helps alot . Mostly what I was looking for. I really enjoy using these templates they have the best instructions that I have come across in a long time. Thank you very much . I am now learning what I tried to learn years ago. The book was really helpful and easy to use. Thanks. I have a tutor who works with an adult learner and the forms and templates are perfect for them to use. Thanks! 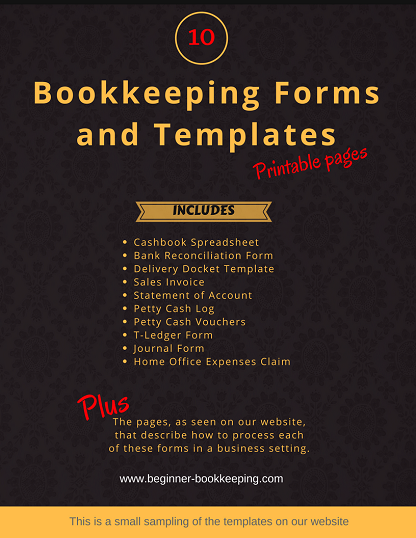 Really helpful for easy information on bookkeeping. Well done and thank you. Love the templates. I'm not able to use our company QuickBooks yet so these forms save me so much time! So now I don't have to create my own spreadsheets for our taxes every year like I have been. Thanks for that guys! Thanks for this templates. This is very useful specially like me new in business world and no business background. Highly recommended. Very helpful forms and examples. I am so grateful that you have shared your knowledge on bookkeeping Sarah! My husband owns a small business and we have decided on keeping the books ourselves. I purchased a Book for Dummies and not only was I discouraged but very confused. I found your webpage and have found it so helpful! I have a wonderful system thanks to your advice and free templates. I look forward to learning more from you! Thank you Sarah! Jill & Ed with Maurer Painting. Yes I found it very helpful, will definitely be referring to the forms and templates again. I found the templates very useful used to work on accounts a long time ago but forgot the best layouts. Very helpful and useful book . Contains all the files you could possibly need! Very interesting books, easy to learn. The examples are good and understandable. Keep it up, good work done. Helped me a lot in starting my bookkeeping for my small company. I received the templates and found the single entry form was just what I was looking for. As we continue to grow our CBI program the other form could be of some use. Thanks. I'm very rusty at book-keeping, and have just taken responsibility for an association account, and so this book helps me to re-engage with the task. Thank you. I find the single-entry sections very useful. I'm the Treasurer of a small neighbourhood group with a turnover of only a few thousand pounds, but this book gives me a great understanding of how to accurately and methodically produce accurate cashbooks. Some of them are very useful. Thanks. Very easy to read and to execute the directions. Not a real numbers person but Bookkeeping Forms and Template made learning a snap for me. Very useful. I'm looking for those form for a long time. Thanks Beginner Bookkeeping. Very nice. I love the organization.. I'm new to Bookkeeping but I understood quickly the plain, easy to understand format this site is written. Bookkeeping Forms and Templates quickly refreshed my memory from accounting courses taken long ago. Your book was exactly what I needed; a refresher course on my accounting classes to enable me to set up records for the management of my friends' foundations. Great resources, makes everything understand-able. Have used this in conjunction with a course I am doing and have found this book and complete site invaluable. It's a good book. Wish there was a couple more form layout options for the forms included...the explanations given are wonderful and easy to get understand all in all good book. I found your eBook very helpful in reviewing double entry bookkeeping. Thank you so much! I think its a great resource, thank you . I thought it was put together really well. It is definitely helpful to those who have a tough time with bookkeeping. Excellent and very helpful. Thank you. Very okay I can start learning from it. Thanks . Easy to use. would recommend . I have started a small business operation in Mexico and it's been great from the start. A couple of days and I was applying the concepts and putting the templates to work in no time. My small business has benefited from day 1 of using this eBook. Great website and great support material. Very simple and comprehensive for a new business entrant. This hit the spot for me. I simply wanted some help keeping the books for a small club and it answered all I needed. Thank you. I found the book very useful and have subsequently sent it to a couple of friends for reference also. Great way to learn how to keep books or refresh your memory and to set up your own books. Lucid and easy to understand. The book is very useful to my job and we have a general cashbook that are linked to other books, that will be very convenient. Fabulous free resource, thank you so much! It was great seeing different examples all in one place. Thanks! Great book with really good templates. Awesome templates, thank you. Very user friendly. Very useful and well put together . Find it interesting and useful. Very good. Helped me a lot. Thank you. Thank you for this phenomenal resource! This book and your entire website are founts of information for the beginning bookkeeper, and I will continue utilizing them for many years. Made very easy and simple for a novice but yet is efficient.